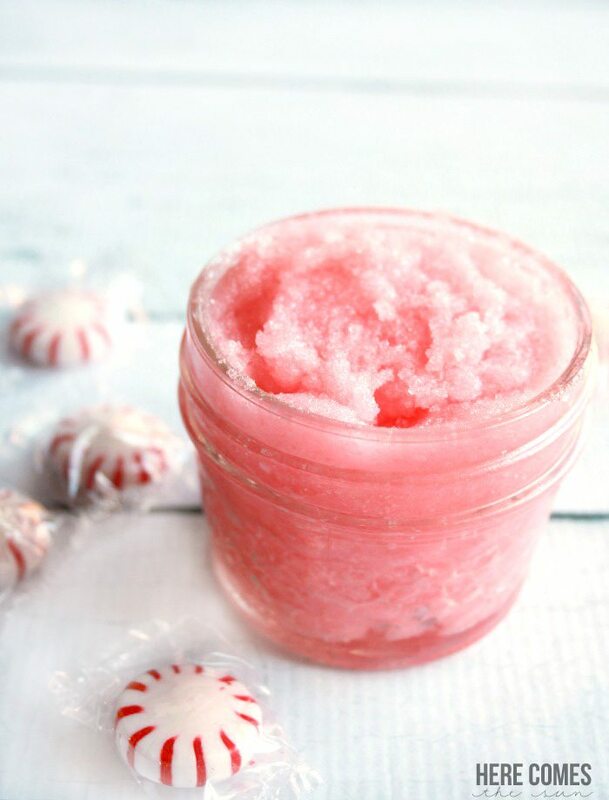 Inside: This peppermint sugar scrub is the perfect way to pamper yourself or someone else this holiday season. I’m kind of on a peppermint kick lately. I love the flavor and nothing screams Christmas more than peppermint. Except of course maybe some ugly Christmas sweaters. Peppermint gifts are so fun to give and to get. 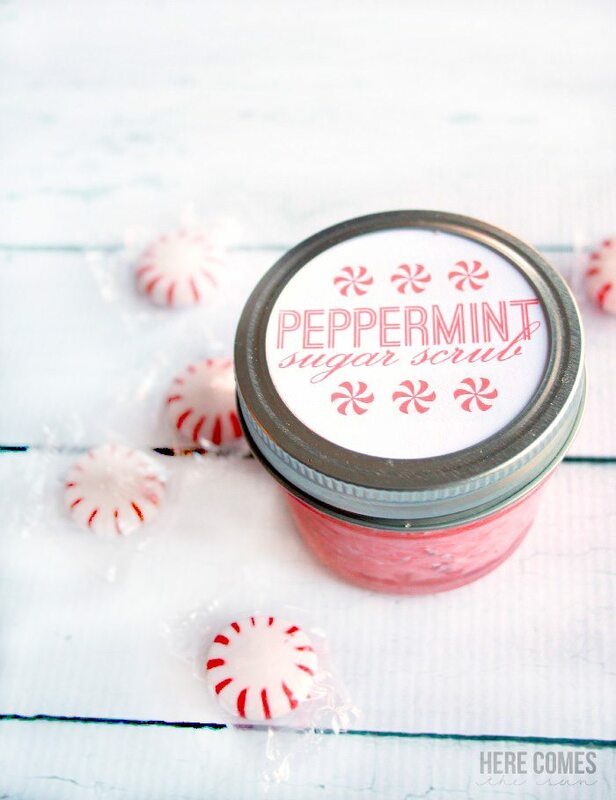 Of course, this peppermint sugar scrub can be used at all times of the year…not just Christmas. I love using scrubs in the spring and summer to get my skin silky soft and ready for beach weather. Homemade sugar scrubs are an affordable way to enjoy a spa day at home. Put all ingredients in a bowl and mix together until food coloring is evenly distributed. I personally love this Peppermint Essential Oil, and this Coconut Oil. This scrub goes great with my peppermint body butter and peppermint foot soak. Package them all up together for the perfect Christmas gift! I’ve created some free printable tags for you to use too! This recipe makes enough sugar scrub to fit in the small jelly mason jar pictured above. I love these little jars. Not only are they adorable but they are the perfect size for scrubs and lotions. Double or triple the recipe to make a bigger batch. My friends have gotten together to bring you more great Easy Christmas Gift Ideas. Make sure to check them all out! This looks incredible! 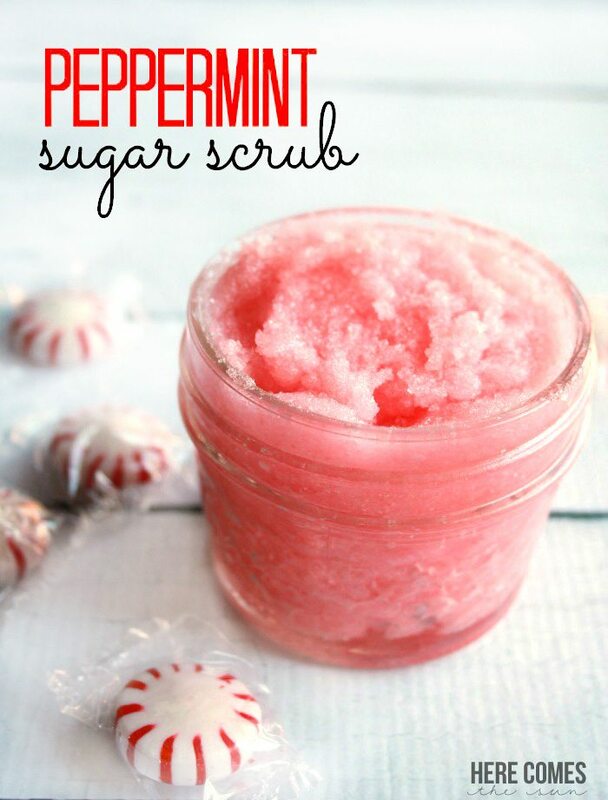 I love scrubs, and I love peppermint…how could this be bad?! 🙂 Can’t wait to try it. I LOVE making sugar scrubs for Christmas gifts. I made a Peppermint one last year, but used green food coloring instead. It was loved by everyone I gave it to! And I love that it is so easy to make and give. Can you think of any reason you couldn’t you use plastic containers? Just wondering……thanks! Plastic containers would work fine! Does it have to be essential oil? Can it be extract? I can’t find peppermint essential oil anywhere locally and don’t have time for shipping. Thanks! You can definitely substitute extract for the essential oil. I made a jar of this for my daughter for Christmas this yr and she used it all up( I had made a double batch). She liked it so much that I made more up today, another double batch. I also made some lavender scrub for my granddaughter, and made some tangerine up too. All double batches. Thank you for sharing this. So much cheaper than buying a good one, and no junk in it! I’m so glad that your daughter liked this scrub! Tangerine sounds wonderful! I have some lavender essential oil and have been considering making a soothing/calming scrub. Thanks for stopping by! What a great find! For the nice labels that you made, did you use an Avery label and if so, which one? If not, what did you use? thanks again! Thanks so much, Naomi. You can use a full sheet label or cardstock with double sided tape. Do you know how long this will last? Will it turn bad? Hi Michelle! I have already used up the peppermint scrub that I made for myself so I’m not exactly sure. However, I made another variety of sugar scrub this past Spring and it is still good. Hope this helps. Could I possibly use soap colorant rather than food coloring? I have never used soap colorant but it seems like it would work fine. Thank you! Also – do these scrubs have a shelf life? Or are they always usable if they’re contained in the jars? I’m not sure what the exact shelf life is. However, I have had my homemade coconut oil sugar scrub for a year and a half and it is still good. Hi I LOVE your recipe but I was wondering what size jars you have showed in the picture? Hi Miranda. The jars are 4 ounces. This just says sugar scrub- can it be used on the lips as well as the body? Hi Jenna! I have not used it on my lips but I don’t see why you couldn’t. Do you use solid or liquid coconut oil for this? How about for the body butter? Thank-you! Excited to try them both as gifts! Hi Ang! I use solid coconut oil for both recipes. I use the Carrington Farms brand. Hello Kelly–I was wondering where to get the tags for the peppermint scrub. I can’t seem to find it when I click on the link. Hi Theresa! I checked the link and it is working for me. 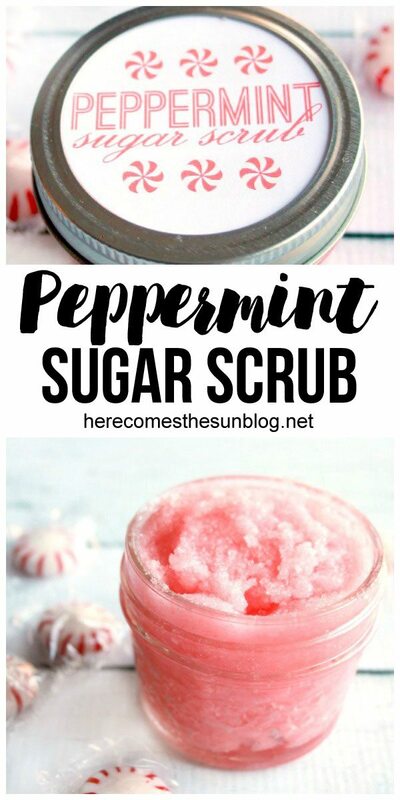 It is the link that says “Download the peppermint sugar scrub tags here”. Please try it again and if you are still having problems, please send me an email so I can get the tags to you. Hi! I’m so excited to make this as Christmas gifts this year, is this a facial scrub? This is a body scrub only.